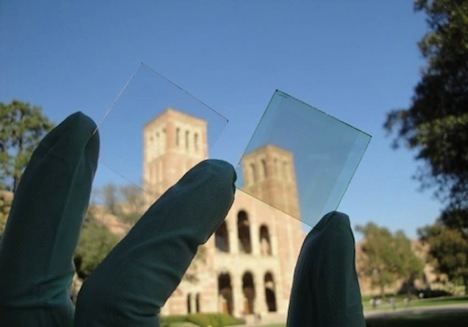 Researchers at UCLA have drawn one-step closer to developing the first viable transparent solar cell. Rather than use visible light to generate electricity, the researchers have developed a solar cell that harvests infrared light. Although the new solar cells are see-through, they do impact light passing through them, giving them a slightly tinted look. To develop the new polymer solar cells, researchers used a silver nanowire-metal oxide composite conducting film that is nearly transparent – the end result is a solar cell 70% transparent to the human eye. With an efficiency of 4%, they are still not nearly good enough for widespread adoption. But researchers at UCLA have still taken a giant step forward in developing a transparent polymer solar cell. The new cells are cheap to produce and lightweight, making them a viable choice once their efficiency improves. Although they are well-suited for windows, they do not feature a high enough transparency to be used for touchscreens on smart-devices. However, integration with consumer electronics is perhaps not too far off. It will be interesting to see how transparent solar cells continue to develop over the next few years. How much of an impact do you think transparent solar cells will have once they become economically viable? Will they have a noticeable impact on a building’s carbon footprint?